Otto Nicolai (1810-49) is remembered because of his last opera, The Merry Wives of Windsor, the only one (of five) written in German rather than Italian and as a co-founder of the Vienna Philharmonic. His second opera, Il Templario was set to a libretto by Girolamo Maria Marini based on Walter Scott’s novel Ivanhoe. It was first performed in Turin in 1840. It was successful and was done in Vienna the following year. While the critics did not care for it, it was a big success with the audience. So much so, that Nicolai was appointed First Kapellmeister at the Vienna Court Opera. It continued to be performed for a while longer until it was overwhelmed by the operas of Verdi, an effect on all Italian operas not by the master from Le Roncole lasting for the next half century. 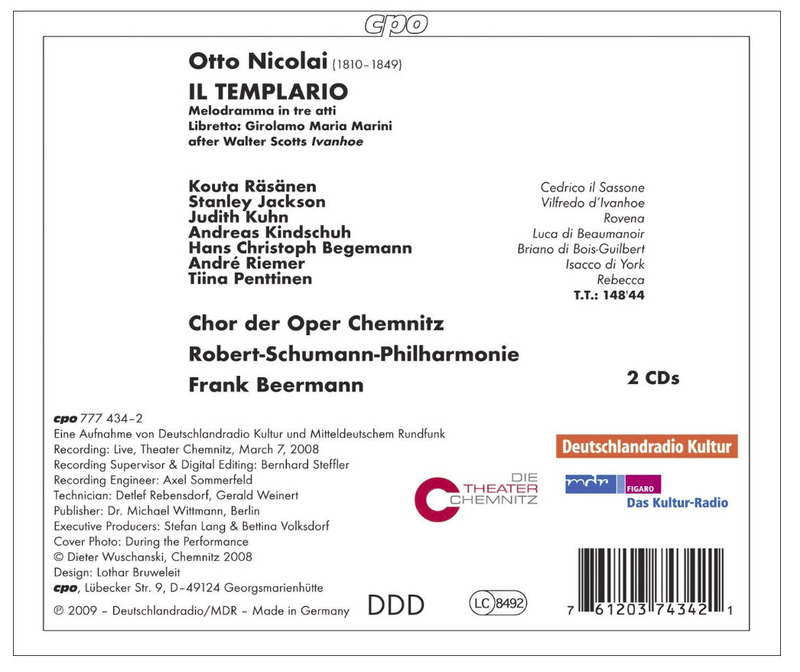 The reconstructed version was performed by the Chemnitz Opera in 2008 under the baton of Frank Beermann. A recording of the March 7 performance was released on CDs and is currently available. A concert performance of the opera was given (twice) in August of 2016 at the Salzburg Festival with Juan Diego Florez in the Ivanhoe role. The synopsis of the opera below is taken from Steven Muni’s review of Il Templario on Amazon’s page devoted to the recording. Only a few excerpts from the opera are available from the Salzburg production. The Chemnitz recording has the obvious advantage of presenting the complete score. Of course, this is an advantage only if the whole opera is worth a listen. Well, it’s more than that. Most operas that disappear do so for a reason – they aren’t good enough to survive. Il Templario is an exception to this rule; it’s an extraordinary work that didn’t deserve to be neglected for a century and a half. When you listen to it you hear an Italian opera that belongs in the bel canto era. Its very well made, but it doesn’t appear to be the work of Rossini, Donizetti, or Bellini. It has its own character. While the singers on the Chemnitz recording are adequate, they are not the vocal equal of Flórez and colleagues. Nevertheless, they are able to transmit the excellence of Nicolai’s writing. Accordingly, the recording is highly recommended for devotees of early 19th century Italian opera. I’ll start with Vilfredo’s (Ivanhoe) first act cavatina. Flórez tosses it off with his usual aplomb. Sia meco avverso il fato. Also from the first act is Fine al torneo. The bass (Cederico, Vilfredo’s father) is Adrian Sâmpetrean. The finale of the first act is from the Chemnitz recording. It’s a fine and distinctive example of this genre so prevalent in bel canto opera. Last is Desso mio figlio, sung by Flórez and Sâmpetrean, from the third scene of Act 2. This excerpt is from the Salzburg show. In summary, this is a fine work worthy of revival. It’s goofy story places it in the mainstream of the Italian opera of its time. It emphasizes what a loss music suffered from Nicolai’s sudden death from a stroke at age 38. It’s fitting that the orchestra that Nicolai helped to found gave Il Templario its most recent and prominent presentation. The cast of the Chemnitz performance is below followed by that of the Salzburg one.